New Year’s resolutions get a bad rap these days. It seems that for every person you know who’s buying new running shoes or a couple of boxes of nicotine gum, there’s a half-dozen more all too happy to explain why, and usually when and how, they decided to forego the ritual. Moreover, they’ll usually offer a sad, knowing smile at the new Nike crossfits, shrugging in their certainty that the shoes will be buried at the back of the closet before Valentine’s Day. This time of year, a time for those who are looking to see something better from themselves, and the ones with a hunger to keep them from doing so, is then a uniquely appropriate time for the story of Don Quixote, a man possessed by visions of a world, and a humanity, better than this one. Luckily, Arizona Theatre Company is prepared with exactly that. Mounting their third production in the 2017-18 season is the classic Man of La Mancha, by Dale Wasserman with music by Mitch Leigh and Joe Darion. With a Tony for Best Musical when it debuted over 50 years ago, four Broadway revivals, the ubiquitous Peter O’Toole adaptation, perhaps the most impressive fact is that people who don’t even watch musicals know “The Impossible Dream”. The show’s bona fides are unquestionable. Now, understand that this new production, under the direction of David Bennett doesn’t need any of that, and manages to not only live up to the mammoth fame of the script and music, but actually eclipses them, presenting an experience that is electrifying, visceral, and fresh. This show is no nostalgia act; it’s a revelation. Wasserman’s text remains, contextualizing the story of Don Quixote around the character of the man who wrote him, Miguel de Cervantes. The majority of the action is still devoted to a play-within-a-play where Cervantes (playing Don Quixote) offers a defense of his uncynical philosophy. However, instead of taking place in a sixteenth century dungeon, the colossal (and vandalized) Franco poster that greets the audience as they take their seats establishes immediately that this Cervantes is tilting at windmills in the midst of Spain’s civil war of the 1930s. The dungeon is now a below-street level tavern, stunningly realized by William Bloodgood’s scenic design and peopled with political dissidents awaiting their day in a kangaroo court. This simple shift recolors every scene of the story, creating an immediacy that will not allow the audience to file the story under the easy heading of a fairy tale or a bedtime story. The challenge to repudiate cynicism is made painfully new and laid squarely before a 2018 audience. Cervantes and Quixote are incarnated here by Broadway veteran Philip Hernandez, who is nothing short of stunning. His Quixote is endearing, and earnest, and unquestionably mad, whereas Cervantes is exhausted, noble, and clearly fully aware of the reality he’s unwilling to settle for. A gentle force would be impressive by itself, but when paired with his rich and stirring baritone, his performance crosses a line into superlative. His performance of “The Impossible Dream” was a show-stopper, and I swear he made taking ownership of the iconic song look all-but-easy. One might readily expect such a powerful performance to outshine those nearby, so it’s to the production’s great credit that the performers surrounding Hernandez are so impressive in their own right. Quixote’s long-suffering sidekick Sancho is brought to giddy and hilarious life by Carlos Lopez, who may have been born specifically to play this part. The pessimistic barmaid/prostitute who finds herself reluctantly envisioned as the knight-errant’s virtuous Dulcinea is here portrayed by Michelle Dawson. Her operatic soprano is transcendent and her ability to project the kind of weariness that comes from carrying around hurt is heartbreaking. Finally, every story worth telling has a good villain. That role (or roles, considering the dual parts) is filled here to fantastic effect by Michael Sharon. He isn’t given pages of lines to deliver, but with a fairly limited amount of time in the spotlight, Sharon creates that magically powerful rarity – a villain who really seems to believe that he’s right. It was noted before the show that it took eight months to assemble this cast. Frankly, I have no trouble believing it, and the time was obviously put to good use. The sheer immensity of the performances put on by the central cast of characters makes it difficult to believe that they would be outshined by the company, and yet that’s exactly what happens. Mitch Leigh’s music under supervision of Tim Symons and arranged by Greg Fulton is played onstage by the company, with instruments passed freely from hand to hand. The talent on casual display is no less than astounding, and only moreso when Kathryn Van Meter’s choreography comes into play, creating a shifting kaleidoscope of bodies and music on the stage that often explodes in complexity, but never devolves into chaos. It’s January, and by bringing a production that mines so much verve, surprise, and raw emotion from such familiar ground, the ATC is laying down a challenge to us all, I believe. It’s a time for impossible dreams, for believing in the fantastic, and questing for new adventures. I’m inclined to agree, and I would hasten to add that catching this show would be grand and worthwhile adventure to start the year. 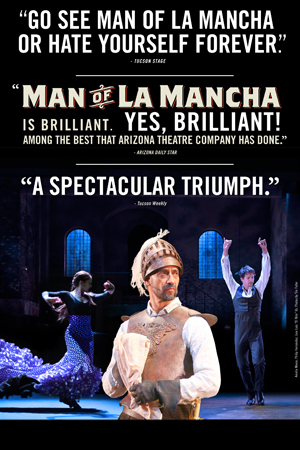 Man of La Mancha opened January 5th, and runs until the 28th. Information and tickets are available through the Arizona Theatre Company.